A suitable tool to safely discharge capacitors is needed when you want to work with circuits that have dangerous voltages inside them. Typical examples of such devices mains powered switch mode power supplies (you need to safely discharge main capacitor) and different cameras (the flash unit has a large capacitor charged to 400-500V voltage). Those capacitors should be discharged with some form of tool that limits the discharge current to some safe level (if you just short circuit the capacitor you get very strong current surge and spark that can easily damage the capacitor and circuit board, and can be dangerous to you). I used discharge capacitors those earlier with a circuit that consisted of around 2 kohm power resistor (few watts) connected in parallel with a multimeter (it shows the voltage left on capacitor). The construction worked, but that hack did not feel safe in use. Some time ago I got Repair Tools Sparkpen Capacitor Discharge Pen for Camera / Mobile Phone / Home Appliances tool to help to safely discharge capacitors on different electronics devices. - Used for release unnecessary power quickly, avoid short circuit on the maintenance of camera, mobile phone, home appliances. The product construction feels pretty solid and though out. 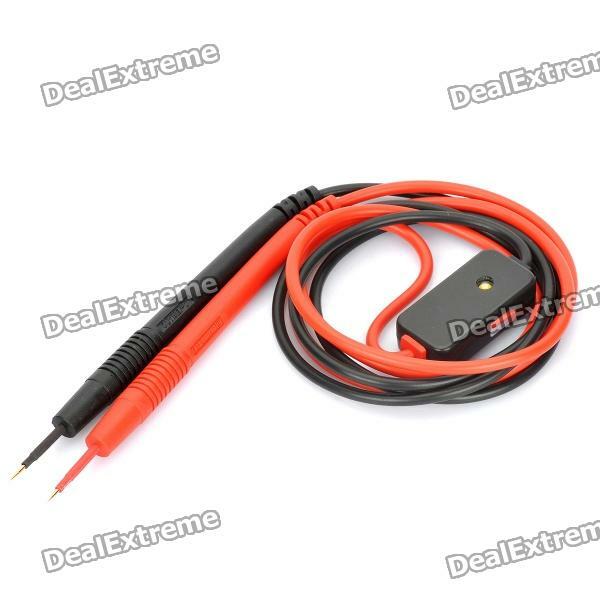 There are those two multimeter lead kind of wires and small plastic box with two LEDs on it. I tested with some capacitors and the product seems to do it’s task well. In first uses I found one downside on the design: There are two LEDs on the opposite sides of the small box, and one of them lights up when discharging capacitor (which one depends on the polarity of the voltage you connect the circuit to). Because the LEDs are on the opposite sides, you can only see one of them at one time (and other hidden). I would have liked to have design where the light would have been visible from all directions. One thing this product lacks on the description (which is all instructions that has been gives) are the exact technical parameters like what is the maximum voltage this product is designed to work with. The other information missing is is there some limit how large capacitors can be safely discharged (there is for sure some limit how much energy this small box can safely absorb). Even a little Google search did not give pages with solid technical data on this. To get some idea how the circuit was built I did some measurements. I first tried measuring the resistance between wires. Normal multimeter gave “open circuit”. Then I tested the circuit by feeding different voltages to it, measuring current and looking at LEDs. It seems that LEDs start to give out full light at at around 3V voltage (very dim light below that). When measuring the voltage-current response, it seem that voltages higher than 3V the response was pretty close to 1 kohm resistor. So my idea for the approximate circuit inside the device would be around 1 kohm resistor for discharging and some indicator LED circuit probably in series with resistor. Hello, your articles here Sparkpen to discharge capacitors safely « Tomi Engdahl’s ePanorama blog to write well, thanks for sharing!